Begur is a municipality in the comarca of the Baix Empordà in Catalonia, Spain, on the coastline of the Costa Brava.Begur has 3,986 inhabitants (according to the census of 2005). It is an important tourist attraction in the Baix Empordà. During the summer, the population can exceed 40,000 people.Despite its tourist character, the village has important historical remnants that go back in early history. The castle of Begur is a good example of medieval remains. The castle was constructed in the 16th and 17th centuries.The town of Begur also includes Esclanyà (with a Romanesque old part), Aiguafreda, Sa Riera, Sa Tuna, Aiguablava and Fornells. 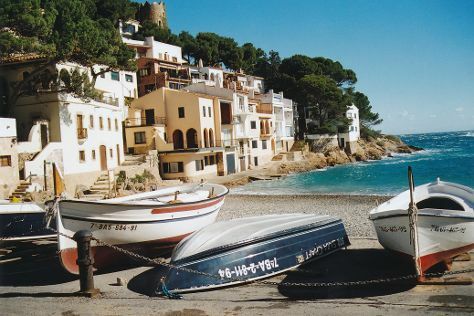 Some of the most prestigious beaches of the Costa Brava can be found here: Sa Riera, Aiguafreda, sa Tuna, Platja Fonda, Fornells and Aiguablava. The latter is also home to a Parador Hotel.The municipality includes the following localities: Aigua BlavaAiguafredaBegurEsclanyàFornellsel RacóSa Rierasa Tuna The annual festival to celebrate St. Tania takes places each November. Begur is in Costa Brava. To personalize your trip to Begur, create itinerary details specific to you using our Spain itinerary planner .